Today the Investment Company Institute (ICI) updated its weekly recap of money flows into and out of US mutual funds. 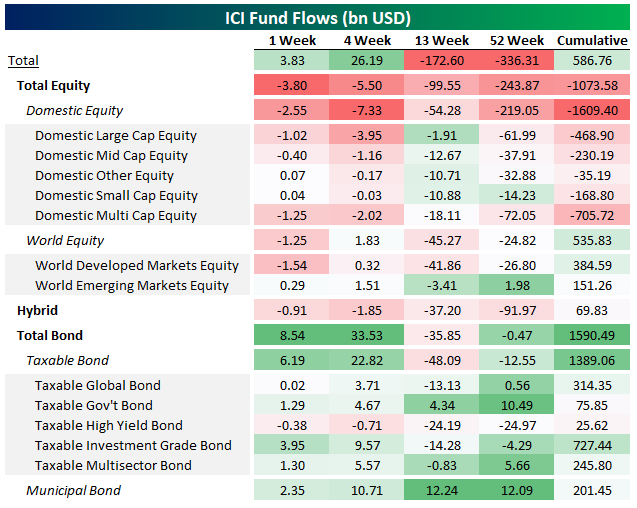 While fund flows continue to run at a strong pace in aggregate ($3.83bn of inflows in the past week, part of $26.19bn of inflows in the past 4 weeks), there’s been a complete halt to equity inflows. As shown in the table below, every category of domestic equity fund has seen outflows over the past four weeks and all but two small categories of domestic equity funds saw outflows over the past week. At the same time, bond markets have seen massive inflows, with more than $8bn of inflows in the past week and $33.5bn in the past four weeks. The only category of bonds that have not seen inflows is higher risk high yield bonds, which have seen outflows over the past week and four weeks. Municipal bonds have also seen very large inflows; over the past four weeks, that asset class has seen the largest rush of new cash on record dating back to 2007, more than $10bn. For more on mutual fund flows, make sure to check out The Closer tonight.